Retail Price: $19.99 Log in for LOWEST PRICE! This was a relatively surprising choice, as we have featured very few Chardonnays from Chile. The fact is, there aren't many Chardonnay grapes planted there. But, with the worldwide demand for Chardonnay getting even stronger than it has been, Chile is now on the bandwagon. And we're glad they are. In the past, we've discovered some delightful reds from Chile. And we absolutely love Chilean Sauvignon Blancs. Now, this Chardonnay comes along with the same beguiling character as their Sauvignon Blancs, but still sporting perfect Chardonnay flavors. As with Sauvignon Blancs from the area, our selection offers very clean, pinpoint flavors that, though distinctive to Chardonnay, also exhibit a freshness and substance we find energetic, captivating and thoroughly enjoyable. In other words, Jamie Munoz, Mecedora's incredible winemaker, has done it again. 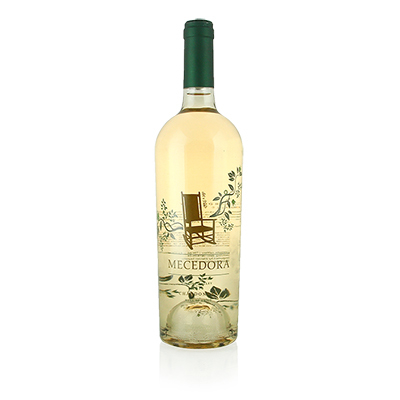 We can't really nail down if it's the clone of Chardonnay they use, the soil, the climate or the process, but there always seems to be a purity of flavor, a clean, vibrant character and snappy finish that follows Mecedora's wines around, no matter what the varietal is. In this case, it's just classic Chardonnay, beginning with the apple and pear aroma, settling into the fresh tropical nuances on the palate, and finishing with Asian pear, pineapple and a lovely citrus edge that just keeps you begging for more. Mecedora delivers once again.